Apollo 16: Man, we're on our way! Those were the words of Charlie Duke, the Lunar Module Pilot for Apollo 16, which launched 37 years ago today. This was the tenth manned Apollo mission, and the fifth mission to land on the moon, bringing Astronauts John Young and Charlie Duke. The primary focus of this mission was to explore Descartes Highlands area, which is considered to be fairly representative of the moon's surface, and is composed of a series of plateaus and plains. This was the second mission to bring along a Lunar Rover, which the two astronauts used to drive a total of 16.5 miles, vastly expanding the range of the astronauts while exploring the lunar surface over the course of three EVA. The lunar landing was almost scrubbed after a malfunction, but the crew was able to land five days later on the 21st. The mission was primarily geological in nature - scientists hoped to use the Descartes Highlands to discover more information about the formation of the moon. 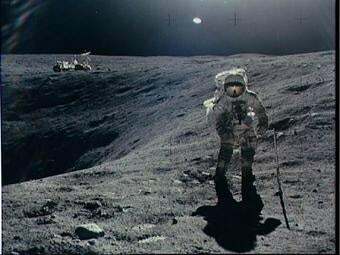 The three moonwalks were used to collect rock samples. The astronauts also deployed an ALSEP, or Apollo Lunar Surface Experiment Package, during their first excursion, which would measure seismic activities, solar wind, temperature and other measurable events on the lunar surface, which would run until 1977. The Apollo 16 mission helped to redefine how we viewed the Lunar surface, and revised several theories as to the creation of the region around the mission site. (The area demonstrated impact created rocks, as opposed to volcanic ones, as had been previously thought.) It is now thought that meteors had a much greater impact in the formation of the modern surface of the moon. The mission was a success, and the crew returned to Earth safely on April 27th, boasting several records - the return of the largest rock collected, and a moon-speed record of eleven miles an hour, which still stands today.